In 2015, we created an AFP MS Diversity and Inclusion Committee. We host monthly Education Programs which are open to the public during a luncheon setting at the Rickhouse. CFRE continuing education credits are offered via our monthly education programs. AFP MS Chapter currently offers the Chamberlain Scholarship. The Chamberlain Scholarship program honors Ralph E. Chamberlain, CFRE. Mr. Chamberlain had a long and distinguished career of service to the Association of Fundraising Professionals beginning in the 1960s when the organization was formed as the National Society of Fund Raisers, through the late 1970s when the name was changed to the National Society of Fund Raising Executives, and until his death in 1999. Mr. Chamberlain's dedication to the organization we know now as AFP never faltered in his long volunteer career with the Association. Because of his long-time support of the Foundation's annual fund and generous planned gift, the AFP Board of Directors renamed their Conference Scholar Program in 2000 to honor Mr. Chamberlain's memory and commitment to the Association. 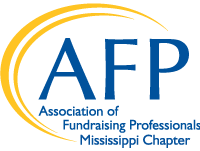 AFP MS offers the Chamberlain Scholarship annually to a first-time member who needs financial support for AFP membership and attendance to the AFP International Fundraising Conference.